ThinkGeek has carved out an ever larger corner of fandom, becoming a one-stop online shop for all the things you didn’t know you needed. 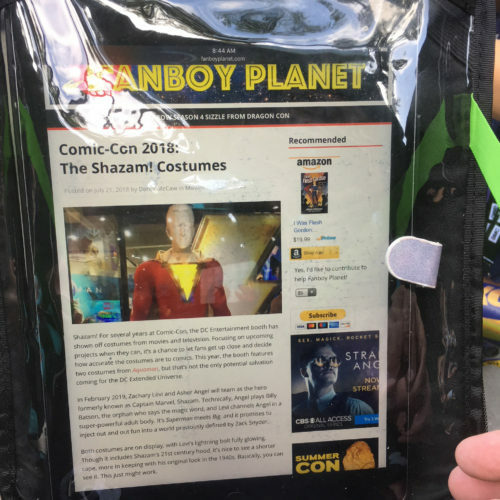 For several years, they’ve come to Comic-Con with a new line of products, for conventioneers to get their hands on first. Some are exclusive; some will be available online. One thing’s for sure — there’s something in there you want. 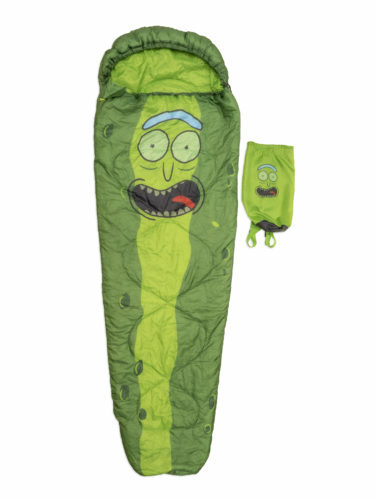 A Pickle Rick sleeping bag! 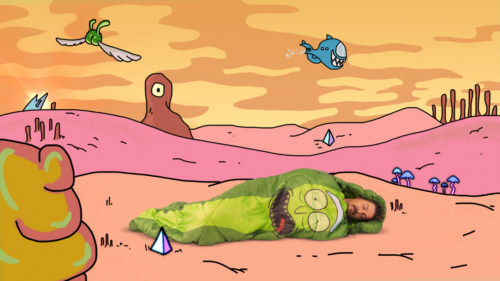 Who doesn’t want to go camping wrapped up in the glory of Rick and Morty’s Rick Sanchez? 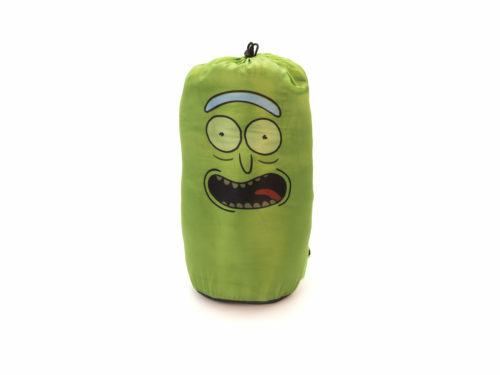 (And for that matter, is it scarier than any campfire story how much Pickle Rick has infiltrated our consciousness?) This bad boy scientist retails for only $25 at Comic-Con! 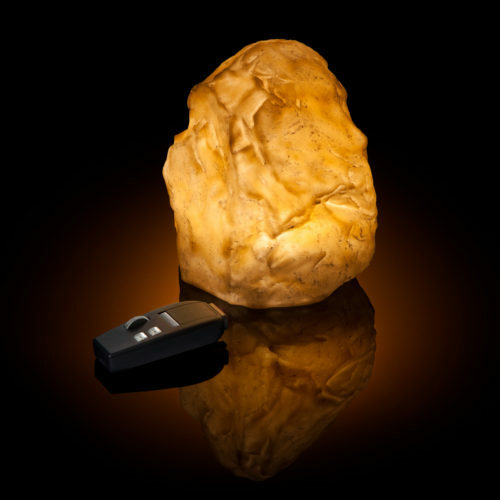 The rock comes with two modes: Survival (which “heats” the rock) and Atmosphere (which turns it into a light show with seven colors). In Survival mode, pressing and holding the remote’s trigger makes phaser firing sounds and imparts a red glow to the rock (as if you’re heating it). The glow then dims once you release the trigger. 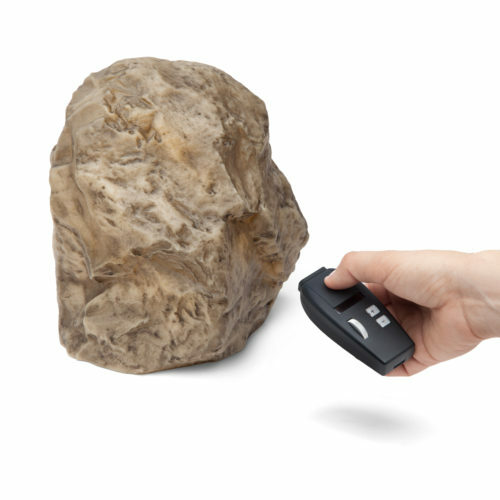 Atmosphere mode can be controlled via phaser remote or buttons on the bottom of the rock. This retails for $70. There’s also an incredible range of pieces tied to Fallout, which will be coming in the Fall. I’ll show some of those soon, but wanted to focus on what for me is the most interesting offering for Comic-Con — a convention-specific Bag of Holding. I’ve had a Bag of Holding for years, and it’s one of my most treasured possessions. For convention purposes, they’ve streamlined and modernized the bag, so for Saturday at Comic-Con, I gave it a try. The front panel has a velcro backing so you can move patches around, personalizing the look. Maybe not a matter for me, though I do appreciate that the Comic-Con patch for 2018 reminds me of the Westworld logo. 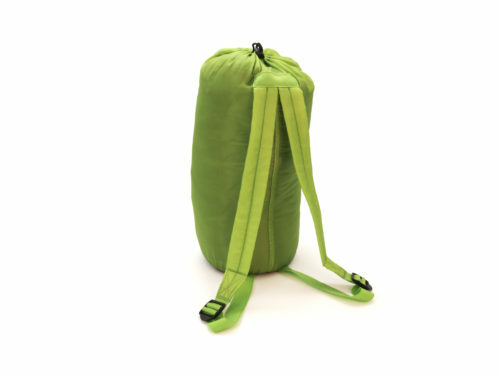 The bag itself has three major compartments, one down from the regular full-sized Bag of Holding. 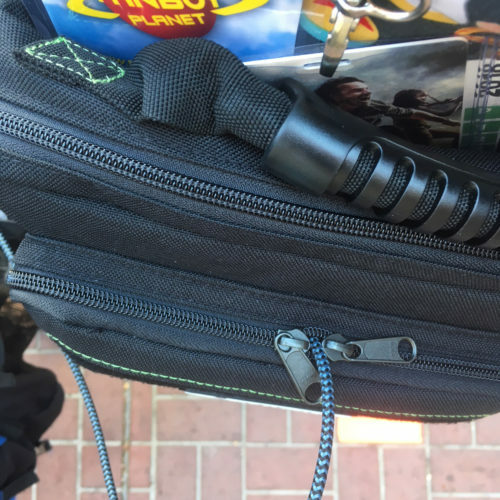 But the front compartment was put to the test as the mobile Fanboy Planet office — placing my tablet in the sealable clear sleeve, as I sat in line, I took out my portable keyboard and began work on an article. By having the tablet (and bag) already anchored, it was one less thing to juggle on the sidewalk and actually easier to work with. Score one for the Convention Bag of Holding. The main compartment has room for art prints, comics, and books that you might pick up, but you probably don’t want to overload this. That’s good advice for the traditional bag, too, which I often ignore, but this size made me a little more conscious of it. In this main compartment there’s also a grommet to run cables through — either charging your tablet from a charger secure in a closed compartment, or your phone. A third back compartment can hold those extra books that you bought after ignoring the advice for the main compartment. One side has a mesh holder for your poster tube, and the other (which I realize has become pretty standard) has a mesh holder for your water bottle. So you’re loaded and good to go. 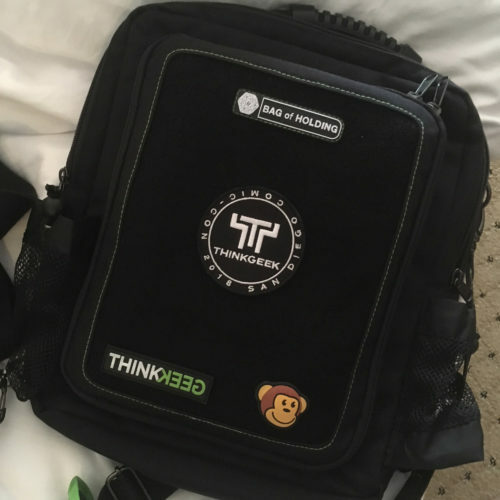 Day 2 of the Bag will happen today — and as we have WorldCon 76 coming up in August in San Jose, you might want to stop by ThinkGeek’s booth #3349 (if you have time today) and pick one of these up.